Complete kit for creating a Landing Zone for Helicopters. Perfect for fire departments and First Responders who need to set up an LZ (Landing Zone) for an emergency air life by EMS. These kits consist of 6 light PUKS, that contains 21 bright LED's. Blue Case with Yellow / White light that can be programmed for up to 9 different light sequence. The kit consists of carrying case and six light PUKS. The light is rechargeable with a 12-volt auto adapter or lighter plug, included. The carry case has indicators that charge up each individual light and will indicate if one or more units are low. Each kit is easy to stow away and light enough for fast deployment in the field. Each PUK has a magnetic backing so you can place anywhere on the ground or on a vehicle. 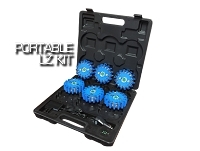 The LZ Marker Kit can also be used for traffic control. Each PUK can be activated with a solid light program or flashing light and set up as markers on the road. Heavy plastic construction can withstand being run over or dropped.